Ordinarily I tend not to cover bricks-and-mortar retailers for a couple of reasons. First off they’re in an increasingly perilous position given the secular trend of online shopping, which tends to affect certain areas of retail more than others. Books, for example, have been absolutely ripe for online shopping because you can easily transfer the process from offline to online. Want to read a few pages before you buy the latest novel? Easily done online these days with the likes of Amazon. In other words even if you prefer physical books to e-books there’s still much less reason to ever visit an actual physical book store. Now compare that to apparel. Despite an absolutely huge online marketplace you will always have physical clothes stores for one simple reason: it’s harder to “preview” a dress when you’re sitting at a computer rather than in a store changing room. Given that fashion tends to be more expensive than a novel you can see why many folks, especially women, still flock to clothes stores rather than online. The second reason to not like physical retail is that you’re at the mercy of customer trends, cut-throat competition and management decisions. Remember when Tesco was a darling of U.K. dividend portfolios because £1 in every £7 spent in U.K. retailers went into one of their tills? Now they’re in the fight of their lives as the likes of ultra efficient Lidl and Aldi have battered their margins. In each year between 1994 and 2012 Tesco increased their per-share dividend, rising from 2.58 pence per share to 14.76 pence per share in the process, yet by 2016 it had been scrapped completely. In other words things can change really fast with retail stocks. This is where we get to WH Smith (LON: SMWH), which is basically a mega-chain of newsagents across the United Kingdom. Now if you were thinking about it in the context of the previous three paragraphs you probably wouldn’t much fancy it for a long term investment. I mean a chain of shops that sells magazines, newspapers, stationary and books doesn’t really sound too solid in the 21st century. But actually if you were to look at the latest five years of raw figures you’d be pretty surprised. Strong profitability metrics? Yes. 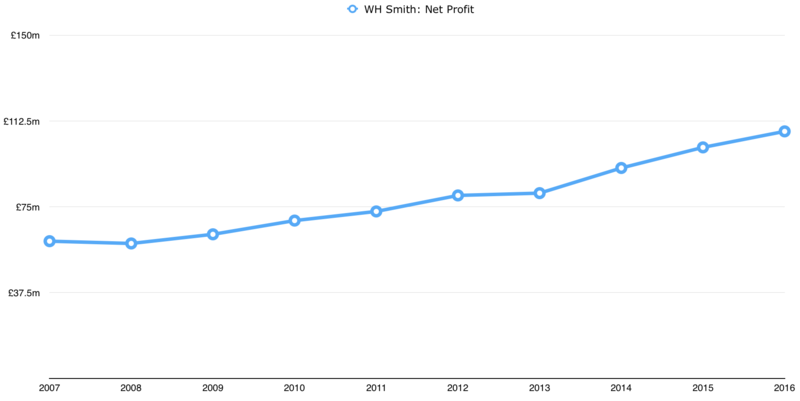 Smith’s has been inching towards 10% net profit margins. Good history of earnings and dividend growth? Yes. The former has grown at a 13% clip since 2011 and the latter at around 14% over the same period (retiring 20% of the share float in the process). Healthy balance sheet? Yes. The company have £38m in cash versus £31m in total debt (although keep an eye on their pension obligations). Alongside that has been the kind of stellar investment returns that tend to attract potential investors. If you bought stock five years ago you were looking at earnings per share of around 57 pence and a share price of around £5.25. In addition you were looking at a 26.9 pence per share annual dividend. Let’s call it 9.5x earnings and a 5% dividend yield; a pretty sensible valuation for a high street retailer. Five years later annual earnings are pencilled to come in at around £1 per share, the prior year dividend is just under 44 pence per share and the P/E ratio is now at 15.75x forward earnings. Despite all those good points I’d be wary of getting sucked into recency bias with these kinds of shares. If you peel back the veil on Smith’s long-term share price performance you’ll find it went through its own dead money period between the mid-1990s and around 2010/2011. Ordinarily you shouldn’t necessarily attribute a poor share price performance, even over an extended period of time, to the fortunes of the underlying business. By that I mean that occasionally investors will bid shares up to such crazy valuations that it can literally take a decade or more for earnings to catch up to the reality of the stock price (e.g. Microsoft and Cisco from the dot-com era onwards). In this case though you can easily just pin it on a bumpy business performance which involved big losses, dividend cuts and, at one point, looked like the administrators would have to be called in. This is why articles on consumer defensive stocks take up so much real estate on the site. If you stuff your portfolio full of the stodgy brand champions you’d be much more inclined to let something like WH Smith sit on the periphery rather than agonise over whether to dump it or not as times look bleak. Anyone remember Blockbuster videos? How about Woolthworths? Or Comet for that matter? You could add JJB Sports and HMV to that list as they’ve all gone into administration over the past decade. What’s the one overriding thing separating Smith’s from those cases? Excellent management. Indeed they’ve chalked up a habit of refreshing themselves over their 225-year history. First off the company have positioned themselves well with their Travel Retail segment (these are the 700+ stores present is railway stations, airports and motorway service stations etc) as it’s one area of traditional retail that looks quite solid. Amazingly 20% of Brits reading a book on their summer holidays will have bought it in a Smith’s store. A decade ago the company had 129 of these travel outlets, reporting segmental revenue of £320m and segmental operating profit of £31m. As of the 2016 annual report (that’s for the financial year ended August, 2016) those figures had risen to 768 stores, £573m in revenue and £87m in segmental operating profit. By way of comparison the other core operating segment – High Street Retail – comprises around 610 stores, £640m in revenue and around £60m in operating profits. The second thing the company did well was to move away from entertainment products like CDs (again ripe for digital online disruption and a major reason why Woolworths went to the wall) and toward bread and butter products such as stationery and paper. Finally, the company have done a superb job of controlling costs. Even though the top line has been pretty much flat over the past five years profits have risen considerably. The problem with these types of stocks as long-term investments is that they require a certain degree of vigilance that you wouldn’t apply to your branding stalwarts. Ex-CEO Kate Swann deserves a huge amount of praise for making Smith’s a standout high street success even though nobody would’ve really been all that surprised if it went the same route as HMV or Woolworths. You never really have that issue with the likes of Unilever or Reckitt Benckiser as their fortunes are tied to physical products with huge amounts of customer loyalty. I’m sure folks will be buying Marmite twenty years from now regardless of whether it’s in a Tesco/Aldi/Lidl/Sainsbury’s/Morrison’s store. Even within the FTSE 250 you can find at least half a dozen companies – perhaps more – with terrific histories and products that you can be confident won’t be going anywhere in a hurry. I imagine that A.G. Barr will still be selling fizzy drink Irn Bru in Scotland – defending their massive 35-40% market share in the country (ahead of even the mighty Coca-Cola). Or that Britvic will be doing the same with Robinsons, Tango, J20 and R. White’s Lemonade. If the stock market shut for a decade and you were left holding those names you probably wouldn’t suffer too many sleepless nights (absent other factors such as balance sheet health etc). With a stock like Smith’s you’re always left wondering whether a poor management team or overpowering secular trends will do irreversible damage to the underlying business.